This past week, Cissy and I made these chocolate and peanut butter whirligig cookies. How about joining us for some tea and cookies? I always love using my cottage teapot, and my leaf plates. My table covering is a tea-towel that a sweet friend sent me. My Royal Albert teacup was also a gift from a friend, which belonged to her late mother. It's such fun to get out seasonal teacups. Here's Miss Cissy with her take-home plate of whirligigs. 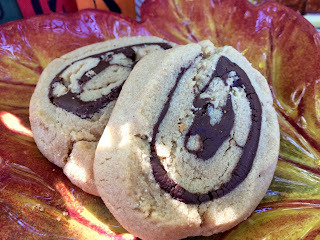 These weren't the easiest cookies to roll, but my oh my, are they ever tasty! Today is my daughter, Molly's birthday!! We left for some girl time with shopping and pizza after Cissy cheered at her game this past Saturday. I received this recipe from the receptionist at my hair dresser's. I've tweaked the directions to make the process easier. Cream together the shortening, sugars and egg. Mix the flour, baking soda, and salt together, and add to the creamed mixture. While dough is chilling, melt the chocolate chips, and set aside to cool slightly. Spread the dough with the chocolate and roll starting at the long edge into a log. Chill the log about 30 minutes. Slice into about 1/2" slices. Using a serrated knife that has been warmed will help with this process. Place the cookies onto a cookie sheet. Bake at 375 degrees for 10=12 minutes. 🎈Happy Birthday to Molly. These cookies looks so pretty. I am sure that Cissy had fun making them and seeing how they come together. Your tea table looks so charming and your pizza table is great, too! Happy Birthday to Molly! 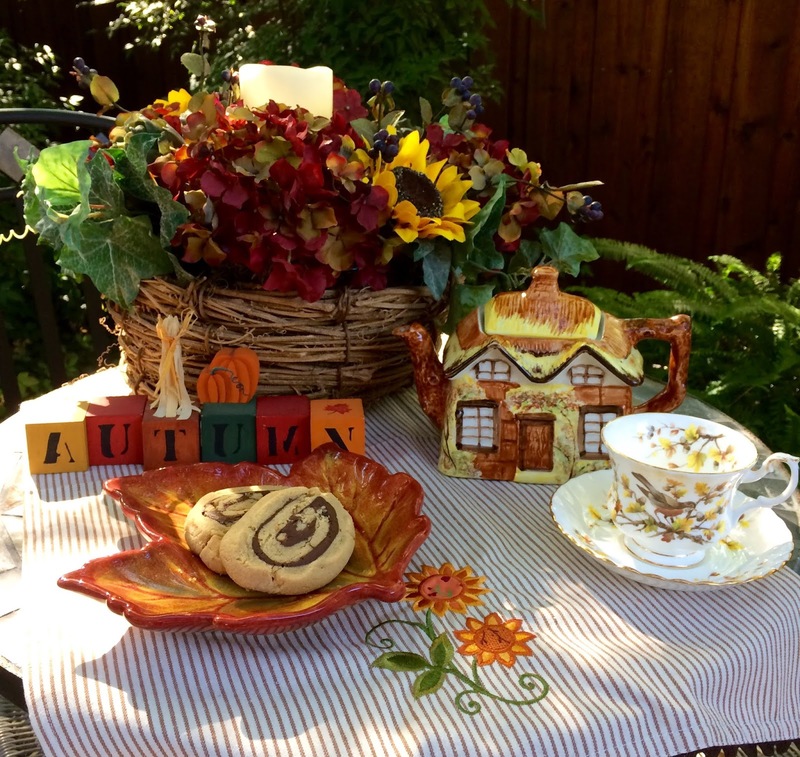 Love your Autumn theme table.....I have that very same house teapot. My husband bought it for me while we were on our honeymoon. More delicious cooking. Kitty, I wonder, how do you stay so thin with all that scrumptious baking?? Oh Jenna, thank you for noticing that I left out the peanut butter!! I corrected the recipe. Happy Birthday to your daughter!Stunning teacup,love it so much.Your Fall table is adorable and those whirligigs look delicious!Hugs to Cissy and you! Another yummy PB and chocolate combo! Your lovely tea setting screams fall. I think that's the first RA bird design that I've seen. Happy Birthday to your daughter! Kitty, That Royal Albert teacup is so pretty. I agree how nice it is to have seasonal tea cups. those cookies look very good. Love the picture of your daughter and Cissy. Happy Birthday to Molly. Three beautiful generations of such pretty ladies! Little Cissy gets prettier each time you post a picture of her, and you and Molly are such beautiful ladies! So thankful God spared Molly to another birthday and you were all able to share it together! The cookies look amazing! I can almost feel the pounds rolling on just looking at them. LOL! Sending love and hugs your way, sweet friend and praying for you. Dearest Kitty! Those cookies look scrumptious! But nothing beats lovely smile of you three lovely ladies! Hope this finds all well with you! You three ladies are all beauties! Happy Birthday to your dear Molly. Love your seasonal setting with the teacup and teapot. The whirligigs are the perfect addition to the table, and look delish! Happy October, Kitty! I would love to enjoy a whirligig (or two) with you and Cissy! You can't go wrong with chocolate and peanut butter! Mmmm...nothing like pizza for a birthday celebration...I hope Molly had a wonderful birthday! Happy Birthday to your daughter. You share the same sweet smile! The cookies look delicious. What fun times you spend with your granddaughter! Your cookie recipe looks wonderful and would be nice for Christmas too. Love the family photo and such a lovely daughter. The table looks very lovely for fall and I too have that teapot as you know and love, love it. Loved my visit here! Happy Birthday to Molly! 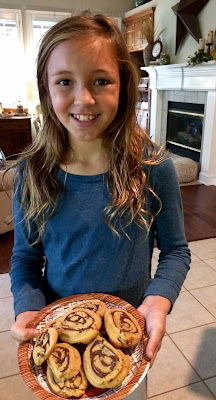 Your Cissy is going to a great baker, just like her Gran! 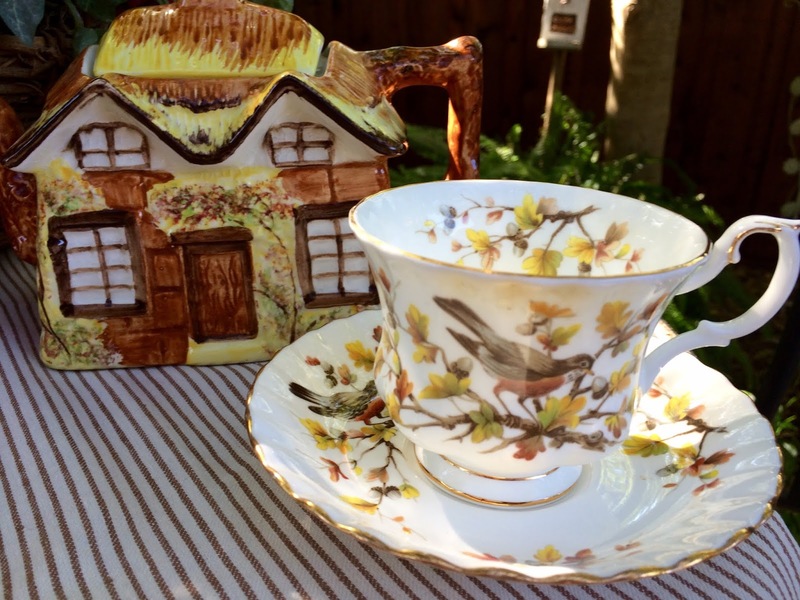 Love the RA teacup -- the bird is wonderful! Happy Tea and cookie day! Hi Kitty...Always love to see your cottageware. And things are just so perfect for fall. Happy BD to Molly. The cookies look wonderful! What a wonderful grandmother you are! Thanks for linking to Tuesday Cuppa Tea! Kitty, three generations of lovely ladies! And your cookies look great. I really like your seasonal teacup; I've never seen that pattern. Kitty, you have such a cute family. Happy Birthday to Molly. Love seeing the three of you together. Such a sweet post, Kitty! The cookies look yummy & I love your little thatched roof teapot...reminds me of the tiny homes we saw in Ireland. I have a handmade cross of wheat, which St. Brigid & the early Christians hid it among the sheaves on the floor, so as not to be persecuted for their Faith. The photo of you & your precious girls needs to be framed!! My dear Kitty, these look truly amazing! And look at Cissy...what a sweetheart! Your tea cup is beautiful and so perfect for fall. Thinking of you. Love and hugs! Button down the hatches, looks like we are in for some serious weather today and tomorrow. Your Whirligigs will be great for afternoon tea on a nice rainy day. I love your cottage tea pot, so perfect! Thanks so much for sharing your post with us at Full Plate Thursday, we have really enjoyed it. Hope you have a great day and come back soon! I hope your daughter had a wonderful birthday! The cookies look delish!! Thanks for sharing with SYC. Wow. I bet they weren’t easy to roll. They look amazing. I hope it was a fun celebration. Thanks for linking to Keep in Touch.